The Knowles-Carter family balled out in New Orleans this weekend. 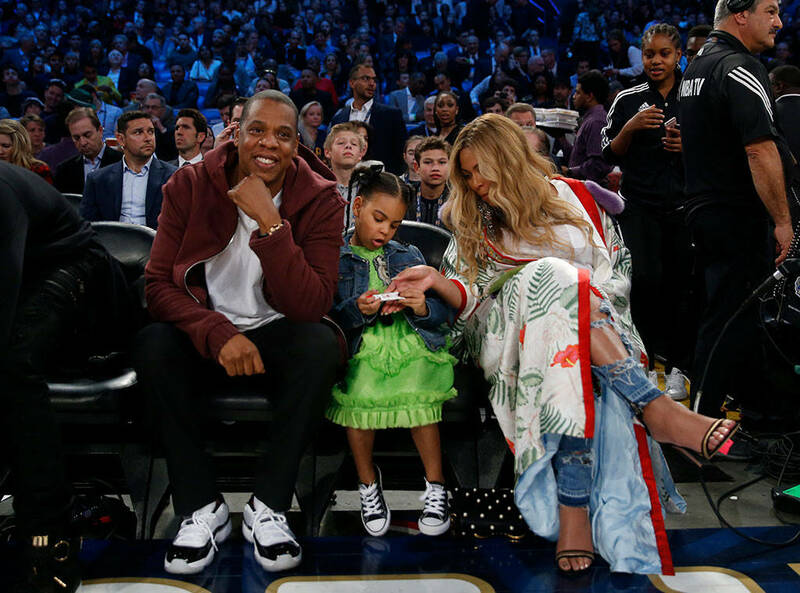 None other than Beyoncé, Jay Z and Blue Ivy Carter were spotted sitting courtside at the NBA All-Star game on Sunday night, and boy was it one precious sighting. The 5-year-old, who will soon be a big sister to Bey and Jay’s twins, looked stylish as ever in a lime green dress, denim jacket and sneakers. Little Blue seemed much more interested in the gadget in her hand than the basketball game, and we don’t blame her for one second. Doting mama-to-be Bey flashed a silly face as she tended to Blue. The music superstar looked absolutely gorgeous in a printed, floor-length kimono, distressed jeans and a loose-fitting white T-shirt worn over her growing baby bump. Jay, who flashed a smile for the cameras, kept it casual in a burgundy hoodie and dark pants. Another celeb family in the Big Easy for the game? Chrissy Teigen and John Legend, of course! The “All of Me” singer shared a precious daddy-daughter moment with their little girl, Luna, who wore her very own pair of mini headphones and a jersey. “Basketball with baby Luna,” Johncaptioned the Instagram pic. As E! News previously reported, Beyoncé and her famous family spent Saturday enjoying the sights of New Orleans and dining at Southern comfort food restaurant Willa Jean. Solange Knowles and her son Daniel Julez Smith joined them for the outing, which included indulging in fried chicken and biscuits.